I was freeing up memory on my 8120, and deleted Brickbreaker, but now I want it back. Tried restoring my BB on a previous restore point, but that didn't restore Brickbreaker. Is there an easy way to get the game back? Going into Brickbreaker withdrawal. Thanks in advance. You should be able to run the application loader in DM, and reinstall it that that way. Check the box to add it back on. Yep, when you go into apploader it will be listed like any other app. Just run the process for updating your OS. Thanks guys, but when I open my application loader, it shows only my 3rd party apps like Opera Mini, Google Maps, etc. Brickbreaker doesn't show up on the list for me to add. What version of the DM are you using? Have you downloaded and installed the OS to your computer yet? If not, download the latest from the stickies and after you install it you will be able to select Brickbreaker. Thanks, I'll try that! Btw, sorry for the stupid question, but can you maybe point me to the link of where I can find the correct OS for my AT&T 8120 to dowload? Just select the 8120 from the drop down menu. Ok, I've downloaded the latest v4.3 DM but still can't see Brickbreaker in the Application Loader. Only 3rd party apps. What am I missing here? Download the latest OS for your handheld as well. Install that on your PC and you will see much more than just your installed apps. Download the latest OS for you BB, not just the DM. You need to have the OS installed on your PC to use the app loader. 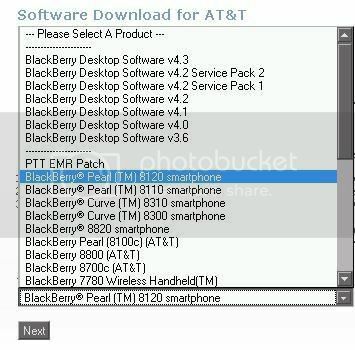 You need to download the latest device OS for your BlackBerry!! Install that on your PC because it contains all of the files for your BlackBerry... then when you run DesktopManager and go to AppLoader, BrickBreaker will be an option... check it off and run!! Doh! Ok, so I'm an *****. Lol. Thanks guys. Last newb question: did that link provided above list the OS software? All I saw was the DM link and a patch. Depends on your device. Check the device specific forums here for your best information. Haha. Thanks man! Much appreciated!! I'm such a dork with these things. Sorry man, gotta ask... from the drop down box, I only see different versions of the DM software and then patches for various Blackberries, but nothing for an AT&T Pearl 8120. Only a patch for a TM (T-Mobile) 8120? Which one do I select from the drop down box that is the OS? Choose the one I have highlighted. A couple of days ago my blackberry's OS failed and everything got wiped (all of my contacts, preferences, applications). and I stupidly never backed-up. So I had to re-download all of my applications through blackberry app world but I have still been unable to find Brick-Breaker, Calculator, or Notepad. Can anyone help me track any of these down? Apploader and Desktop Manager (now Desktop Software) are the programs RIM created for installing apps and OSes onto your BB from your PC.